My brother, who was something of a comics nut (still is, actually), had a bedspread made up of panels that were reproductions of the first issues of Action Comics, Detective, etc. We could recognize Superman, Batman, Wonder Woman and Green Lantern, but one guy had us puzzled. Back in those days the market for comics was primarily children, and just as Robin gave Batman a sales boost, the fact that Cap’s secret identity was an 11-year old boy no doubt helped his appeal. As the ScreenCrush blog put it, he’s the superhero equivalent of the movie Big. Newsboy Billy Batson only had to say the magic word and a huge bolt of lightning would lance down from the sky and transform him into Captain Marvel. The other part of his appeal came from the storylines themselves. Unlike Superman, whose powers had a pseudo-scientific explanation involving our yellow sun, Captain Marvel was magical. He got his powers from a wizard, he transformed from orphan boy to superhero with a magic word, and his stories often involved magic of one sort or another. It’s an interesting mixture – Classical and (Judeo-) Christian. 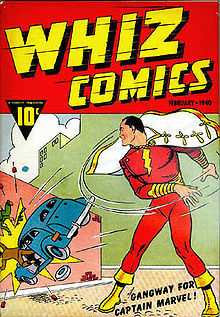 Captain Marvel’s black hair, dark eyes, and general appearance came from a different pantheon: Hollywood. The actor Fred MacMurray, then a young star (best known for Double Indemnity), was the physical model for the super-hero. Cap and Adam have similar uniforms, and they both derive their powers from a magic word and the lightning. This makes them evenly matched, and usually Cap has to resort to one sort of trickery or another to defeat him. In the last while, Adam has become a more morally complex character, who, like Sinestro, has been corrupted by his own inflexible ideas and character. Legal problems of various kinds involving copyright have kept Captain Marvel from the shelves for a long time, although every so often DC tries to revive him. The latest effort came with the New 52, a controversial reworking of the Billy Batson story in the back of the Justice League. In this version he’s a little older, and definitely more streetwise. When he gets his powers, which the old wizard grants him reluctantly, he immediately uses his adult appearance to buy beer for himself and his friend Freddy. He looks set for a life of spectacularly-garbed petty crime until events overtake him, in the form of Black Adam and the Seven Deadly Sins. A lot of people felt that making Billy less like Oliver Twist and more like the Artful Dodger was disrespectful to the character. Billy does keep some of his better characteristics, however. He willingly shares his powers with his friends, and grows into his new responsibilities at an accelerated rate. Really, he’s been given the Marvel treatment – reformed villains are quite common there – which is certainly a different way of approaching the character. I liked it, so you won’t be surprised to hear that Geoff Johns was behind it. He says that he thinks the problem with Shazam is that he was on the shelf for so long, while other characters were evolving as good writers moved their characters forwards. I’m just throwing this out, but a good Shazam story might be a more cheerful version of the 2012 storyline a Death in the Family. Like Batman, Cap is an orphan, whose parents were killed, and who builds a surrogate family, one he shares his abilities with. (In the stories where the Joker is the man who killed the Waynes, he stands in the same relation to Batman as Black Adam does to Cap.) Maybe Adam could try to break those bonds, out of envy or anger, and the Marvels and their allies would finally pull together and defeat him. 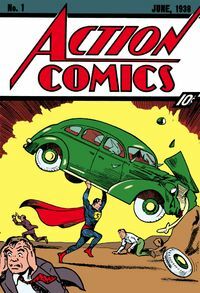 Back then, however, National Comics (owners of Action) saw things rather differently, and they sued Fawcett (owners of Whiz) for copyright infringement. National won in 1953, and Cap began a long exile from the comics, which isn’t over even now. Next, a British imitator called Marvelman was born, and suffered his own legal problems. Later, Marvel Comics would decide that the copyright in the name had lapsed, and introduced their own Captain Marvel, who would go through various permutations of his/her own, originally as the alien Mar-Vell, and later as the human Carol Danvers. Unfortunately, he never seems to have regained his popularity. I’m not sure that in this current climate, where even Superman has to “Batmanned” – yes, Man of Steel, I’m talking about you – that Shazam has much chance. It’ll be interesting to see how the upcoming DC movie will handle the character. I would strongly advise them to check out the Multiversity: Thunderworld issue, which showed both the sense of fun and the dimension-spanning storytelling that a good Shazam story should have. 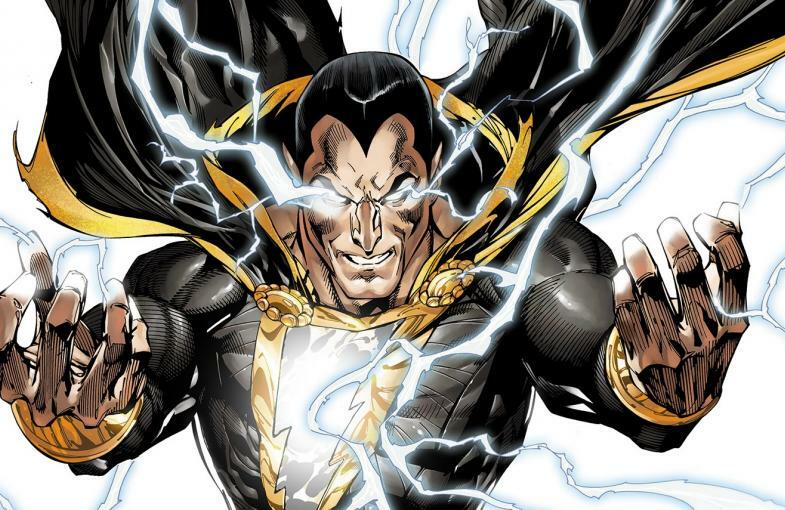 The only thing known yet is that Dwayne Johnson is attached to it, as Black Adam. If it goes big it could kickstart a whole new interest in the character and his world. 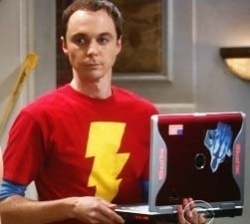 I look forward to a lot of kids in red T-shirts with the BIG lightning-bolt. Morrison, Grant 2011:Supergods: What Masked Vigilantes, Miraculous Mutants, and a Sun God from Smallville Can Teach Us About Being Human, Spiegel & Grau. The image at the top comes from Pinterest. This entry was posted in Comics, DC Comics, Mythology, New 52, Superheroes and tagged Batman, Captain Marvel, Geoff Johns, origin, Shazam, Superman on June 21, 2015 by solsdottir. This is a wonderfully written post. It’s entertaining and it informs (if you catch my Big Bang drift).